Bowling Green, Ky. - June 8, 2010 -- “All Aboard” a look at the history of rail service as told through the restoration of three historic rail cars, will premiere on Kentucky Educational Television starting on Sunday, May 2nd at 10:30 EST/9:30 CST following Masterpiece Theater. Subsequent episodes will air on May 9 and May 16. The half-hour series explores the powerful locomotive; the Railway Post Office Car, the workhorse of the U. S. Postal Service for over a century; and a Pullman Sleeping Car, the symbol of luxury rail travel for decades,. These dramatic stories revolve around the discovery, transport and restoration of three distinct pieces of rail equipment, conducted by a group of dedicated volunteers at the Historic Railpark and Train Museum in Bowling Green, Kentucky. The series begins on May 2, 2010, with Episode 1:“The Power, The Might, The Locomotive,” an invention created to harness ‘horse power’ and move goods across America faster than anyone ever imagined. 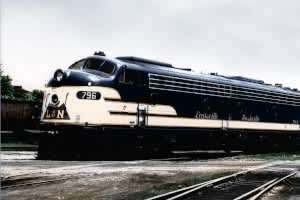 From the time they were introduced in the United States in the early 1800s, developments of the steam locomotive and the highly efficient diesel engine guided passenger and freight transportation. The most elegant of these diesels was built by General Motors Electromotive Division under the nomenclature E8A. Today this story is embodied in the acquisition by the Historic Railpark & Train Museum of former Chicago & Northwestern RR locomotive 2011. The fully documented two and a half year restoration and move of this engine, reconfigured to L&N RR E8A 796 is nothing short of spectacular. Episode Three: A Pullman Sleeper, Last journey of the Towering Pine, airing on May 16th, explores the luxury and high quality of service captured in the Pullman Sleeper and the acquisition and restoration of the historic Sleeper Towering Pine. Produced by Peridot Pictures, a Kentucky production company with strong Hollywood roots, the series is the first installment in the Project Imagination series which explores the accomplishments that are made possible by people who dream. C. Dorian Walker, Producer of the series, is an award-winning film and television producer/director. Dorian received his undergraduate degree in design, while his formal film training took him to LA where he was a Directing Fellow at the Conservatory of the AFI. He has directed feature films from cult classic ‘Teen Witch’ to his latest historical drama ‘American Drummer Boy’. (http://www.americandrummerboy.com) In between he writes, directs and produces for all the major television networks and is particularly proud of his work on Design oriented shows like “America’s Castles” for the A&E Network and “Restore America” for the HGTV Network. Elaine Walker, co-producer of the series, is an award-winning film and television producer/writer. She built upon years of communications experience working for Congressional and local elected officials into Public Affairs Director at KCAL-TV in Los Angeles and ultimately joined her husband, Dorian, in forming Peridot Pictures in Bowling Green, Kentucky. Walker’s work has been seen on major networks, including A&E, Travel Channel and HGTV. The Historic Railpark and Train Museum in Bowling Green, Kentucky, is dedicated to telling the story of the L&N Railroad through an inter-active museum and exhibits located in the 1925 L&N Passenger Depot, as well as a five-car historic rail consist static display. Driven by a group of dedicated volunteers, the organization has garnered national recognition for their work.